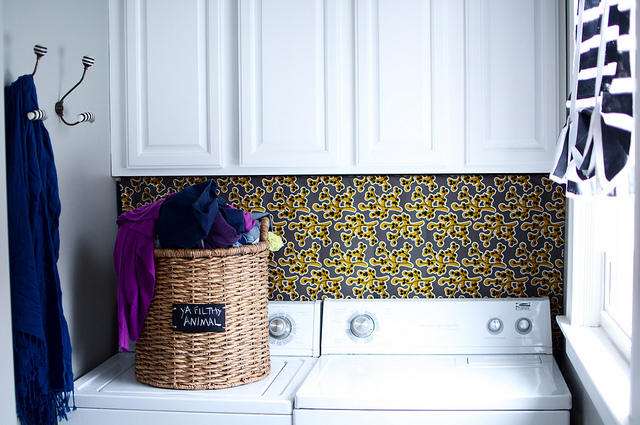 Her 900 square foot 1914 Kentucky home is packed with style. 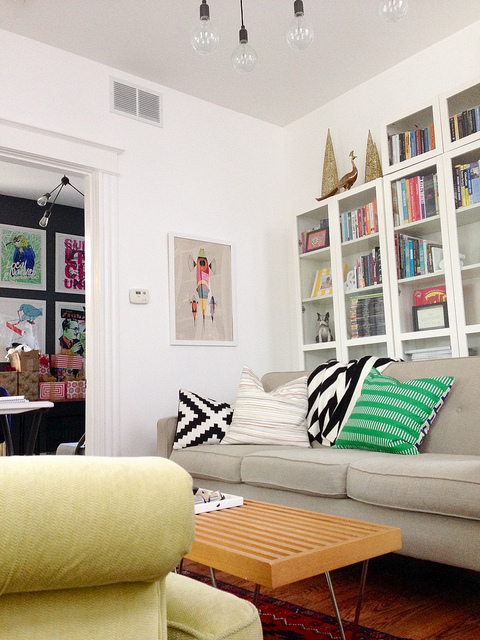 Emily of Go Haus Go grew to love living small and I can see why. A vintage and modern sofa pair perfectly together. and a daybed for power naps doesn’t hurt either. There goes Suge about to power nap. Guess where these chairs came from – an Ohio lottery commercial set! Then she fell in love and the rest is coolest pair of vintage chairs paired with Ikea table history. Every home should come with a fireplace in the bedroom. 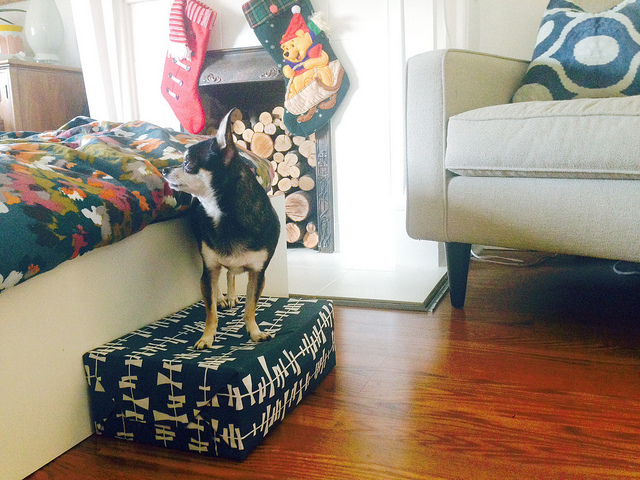 Biggie needed a way to hop onto the bed and you’ll never guess how Emily made this doggie step. 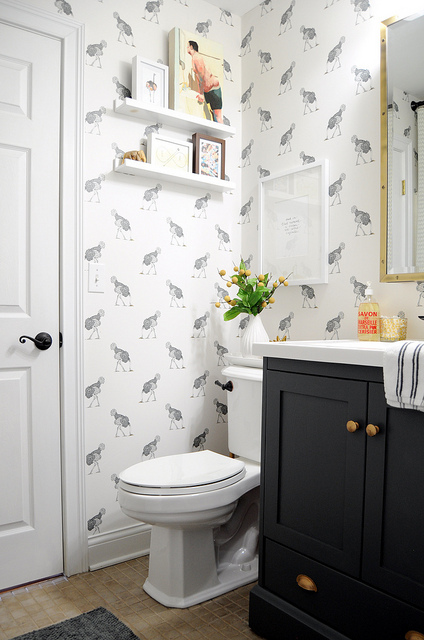 Ostrich wallpaper – oh my! 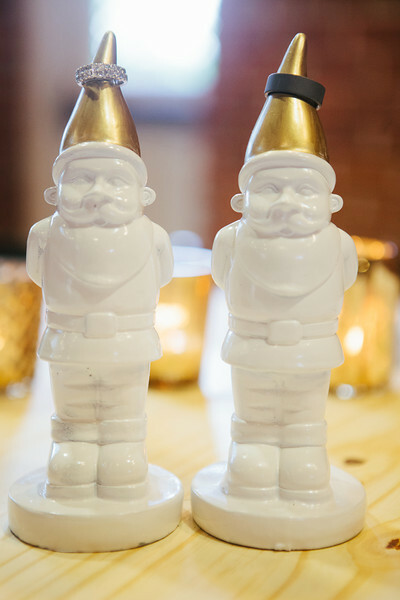 I love Emily’s style but when I saw her gnome themed wedding (think elegant, not cheesy), I knew we were sisters separated at birth. 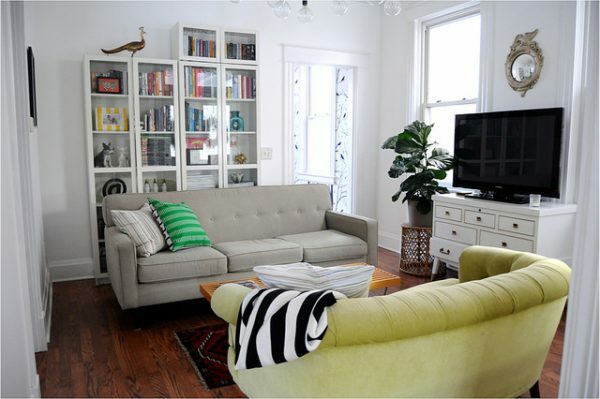 No wonder Emily was a finalist in the Apartment Therapy Small Cool contest! What are you waiting for – go to Go Haus Go. 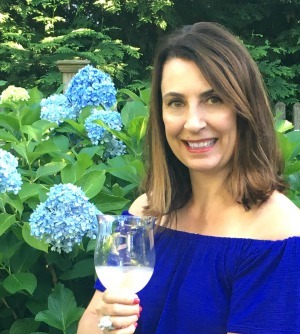 You’ll love all of my Eclectic Home Tours. LOVE me some emily! she is so sweet and adorable and her home is freaking awesome. she’s just a whole lot of fab rolled into one. 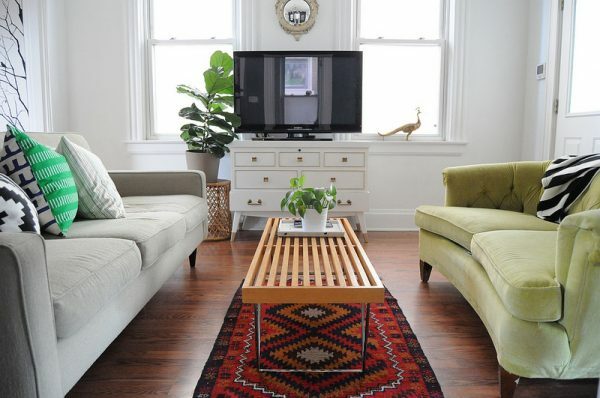 What a fun, eclectic home filled with style…I love it! Keep going back to look at photos, so much eye candy, sure I haven’t seen it all. 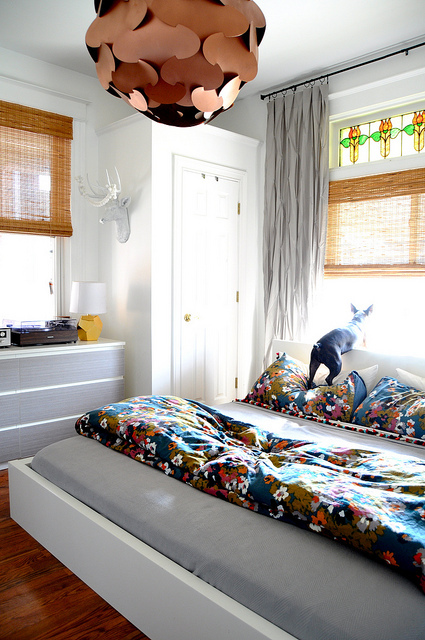 Clever decorating ideas, love that light fixture in bedroom, did she have to put that together? I could enumerate so many things I saw I was so inspired by but sure all of you saw them too. So tidy also. We lived in our 24 ft. travel trailer In Winter in CO for almost a year, trying to keep it tidy was no small feat. Cleaning it wasn’t so easy with coats, boots here and there. Had bunks in back so they were great storage areas. Harder in winter storing cold weather clothes, so many more layers to contend with. Did have a little closet but certainly not big enuf for winter clothes. You have to get quite inventive with making best use of space. I kept our laundry to be done in Suburban, then when I went to do laundry it was all there, not having to look everywhere for it. Had bags for different type of things to be washed, helped to keep it easier when I went to do laundry . 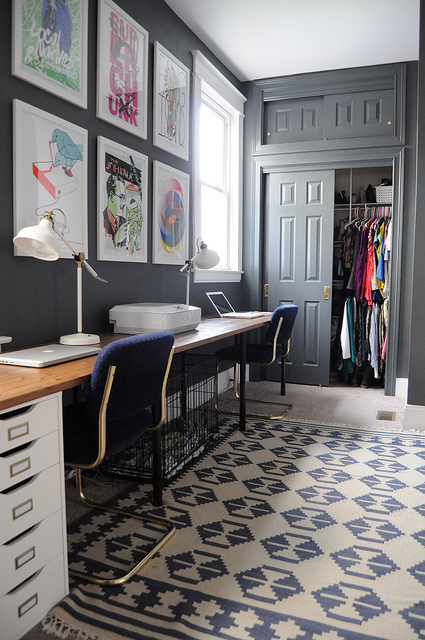 The owner of this home has storing multiple necessities down to an art, very very nice. Love this house. 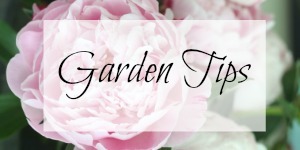 As we get older I find I don’t want big house to clean, want that time and energy to be used with crafting or anything a person would enjoy doing in their home. Bravo to owner, envy them their gorgeous home. Love Emily and her blog! She is amazing! 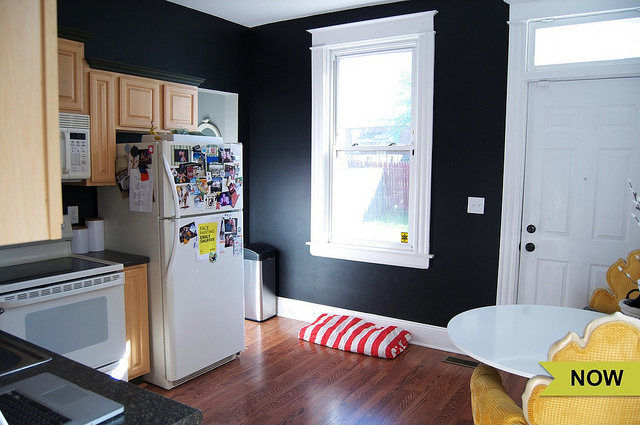 I’m in love with the whole house but the office and kitchen is a huge stand-out for me! Thanks for the tour! I love Emily’s house! It’s gorgeous. She has incredible style and is so inspiring! 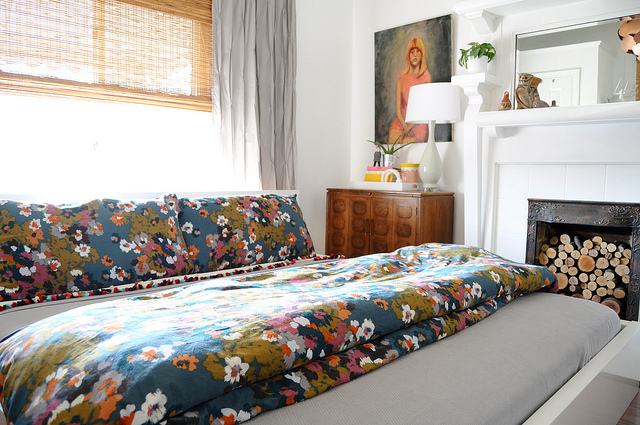 Love love love Emily’s style and home. Love the copper light fixture – very pretty! Would look great in my beach house! I simply adored her home.. 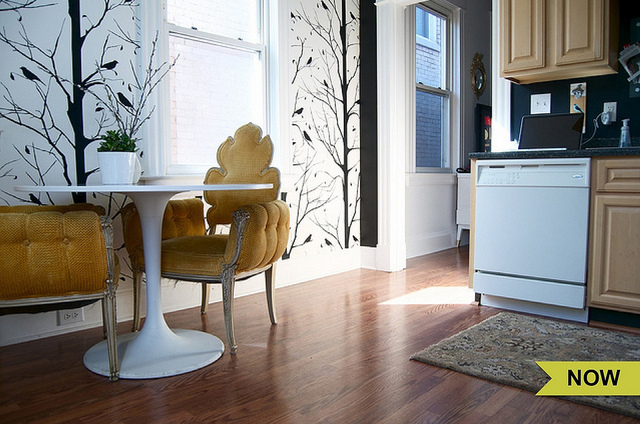 The kitchen chairs.. to die for… I zeroed in on them.. Thanks for presenting her to us. 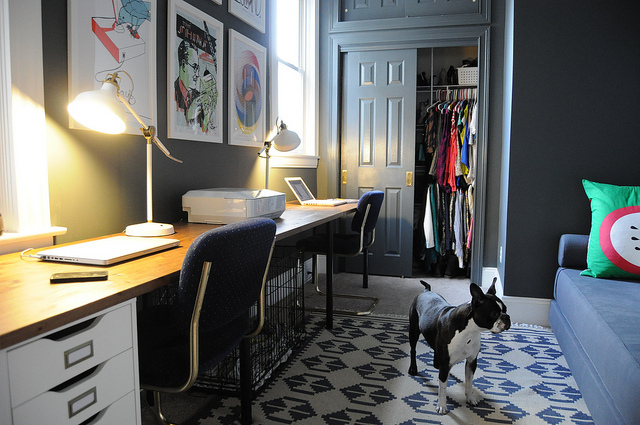 I would totally vote for her!…What amazing spaces…and I am totally loving the color scheme of the “work space”. 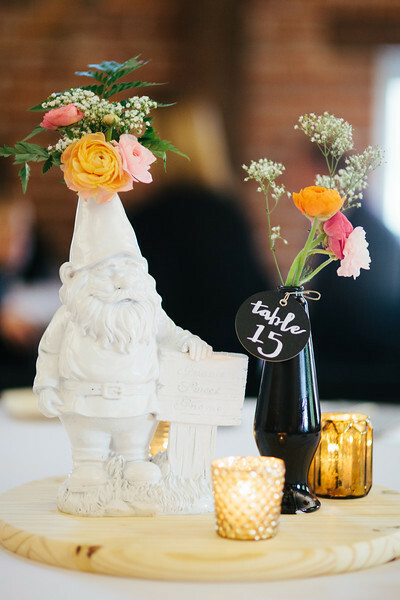 Great home and love the gnome wedding!! !…How could anyone but not smile at the wedding!!! What a cool house. 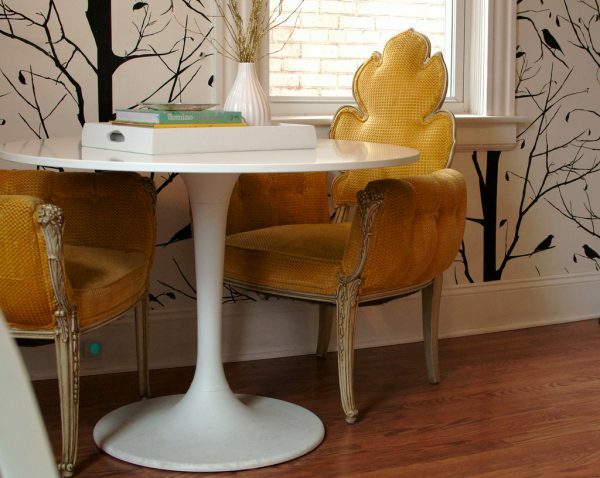 Those Autumn leaf chairs are above and beyond my favorites. It’s a well Gnome fact how much you love your little Gnomes. Wedding themed, that is very original!